On May 9, 2014, Chelsea Gifts will welcome Michael Aram to their store at 635 Broad Street to celebrate the 25th anniversary of the founding of his design studio. It marks Mr. Aram's second in-store visit to the centerpiece store at The Grove in Shrewsbury, Chelsea Gifts. His previous visit to Chelsea in 2010 drew a large audience, and created a loyal fan base of Michael Aram products at the boutique. The upcoming event is scheduled for 12:00 p.m. to 3:00 p.m. EST. Michael Aram has launched a Commemorative Anniversary Collection to mark the important milestone. The Commemorative Collection features some of the designer's most personal and iconic works in the past two and a half decades. It is comprised of functional pieces, and decorations stamped with Mr. Aram's unique touch and artistry. The stunning works include 'Water Hyacinth Candleholders', 'Snail Bowl', 'Neptune Bowl', 'Medusa Serving Set', 'Cat & Mouse Cheeseboard', 'Adam & Eve Ring Catch' and 'Forged Scissors'. Select pieces from the 25th Anniversary collections will be available for purchase at Chelsea Gifts. Michael Aram will inscribe a message on gifts purchased. The event occurs two days before Mother’s Day, giving visitors an excellent opportunity to present a top-of-the-line, hand-crafted gift to a loved one, and have a special message inscribed by a celebrated designer in the metalware niche. Those who are unable to attend the event can place pre-orders, and Mr. Aram will still accept engraving requests. Customers who spend more than $200 in purchases will receive a complimentary Michael Aram gift. 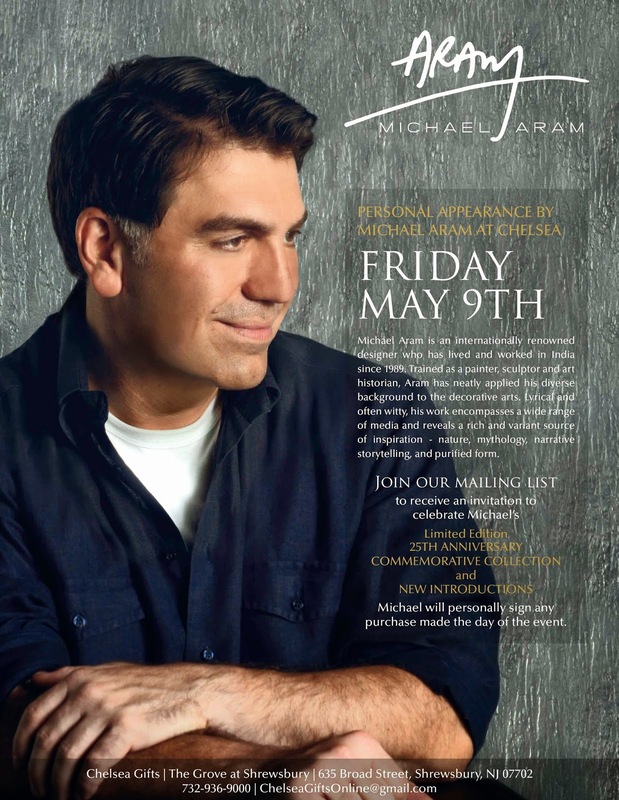 The event will also feature a raffle, and the lucky winner will receive a beautiful piece of Michael Aram’s work. Chelsea Gifts' catalog of Michael Aram products includes a variety of functional, decorative, festive, ritual and dinnerware pieces. Each work is infused with symbolism and has a meaningful quality that places it in a class of its own. Mr. Aram emphasizes old traditional techniques of handcrafting to derive extraordinary results. His versatility and vision have spawned one-of-a-kind collections, which Chelsea Gifts is proud to represent and sell. About Chelsea Gifts: A centerpiece store in Shrewsbury, New Jersey, Chelsea Gifts is a one-stop destination for top-of-the-line designer gifts, jewelry and tabletop items. Chelsea is an authorized dealer of respected brands, including Michael Aram, MacKenzie-Childs, L'objet, Juliska, Ralph Lauren Home, Alexis Bittar, Ted Baker London, Ricci Argentieri, The GG Collection, William Yeoward, and Kate Spade. Visit https://www.chelseagiftsonline.com/ or call 732-693-0001 to learn more about the boutique. About Michal Aram: Michael Aram is an internationally renowned designer who has lived and worked in India since 1989. Trained as a painter, sculptor and art historian, Aram has neatly applied his diverse background to the decorative arts. Lyrical and often witty, his work encompasses a wide range of media and reveals a rich and variant source of inspiration - nature, mythology, narrative storytelling and purified form. Aram's work is also a celebration of craft and age-old handworking traditions. It is the enduring fusion of these ideals - originality, storyline and craftsmanship, that has become the hallmark of this gifted artist. It was such a pleasure to meet Michael Aram at Chelsea's. He is as charming as he is talented. We enjoyed wonderful conversation, laughter and, of course, signing of our purchases. My home is filled with many Michael Aram pieces. Each one is beautiful and special. Thank you so much!